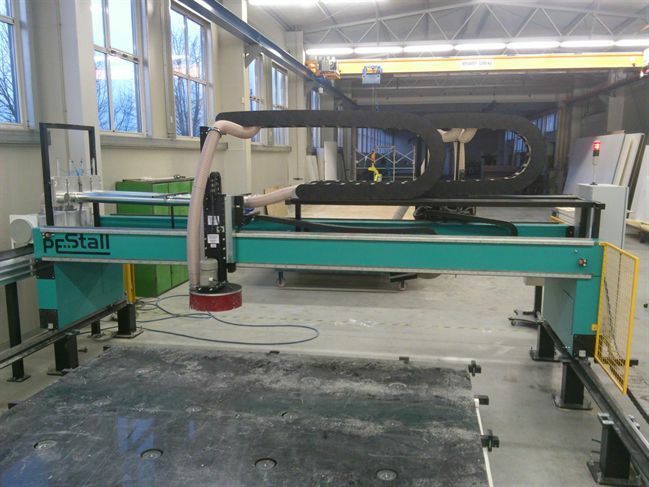 PESTALL URSUS is a specially developed range of machinery for cutting large materials, particularly sandwich panels, intended for making walls and floors of truck trailers, small buildings, etc. The machine features dual, heavy-duty portals, supports are equipped with mechanical tools, circular saws, drilling and tapping spindles, milling machines, etc. Its working width is 3,000 – 6,000 mm, working length is from 10,000 - X mm. 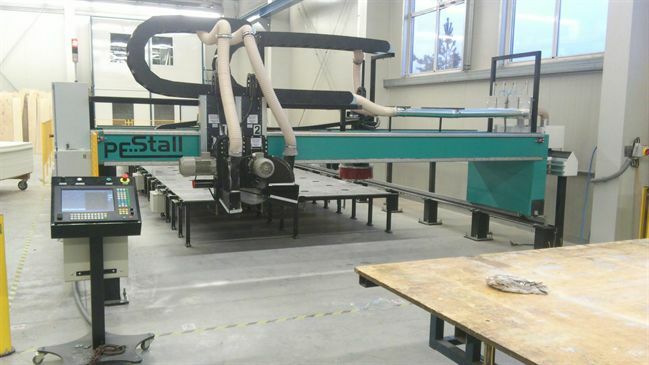 Durable, gantry cutting machine with dual side drive runs along its longitudinal axis on precisely guided rails. Each torch carriage moves along the precision maintenance-free double guides with polished rollers in the Y axis. For the vertical stroke of each torch, polished rods are used with ball pockets. A powerful AC motor is used to drive the machine in all axes, with precision planetary gearboxes on all axes travelled. The material is fixed to the work table using vacuum clamps which are activated based on the trajectories of the individual tools. The vacuum is created by a high quality central vacuum pump. The device uses a unique dust extraction system. A safe working space from the machine operation is ensured by optical gates. The machine is controlled by a MEFI 872 iTD system (Windows) with a convenient control desk, based on a dual-core, high performance industrial computer with a 15” colour LCD touch screen monitor. User friendly software is used for cutting sheet materials.